How to choose a nail salon? Manicures and Pedicures are one part maintenance, one part pampering and one part social fun. 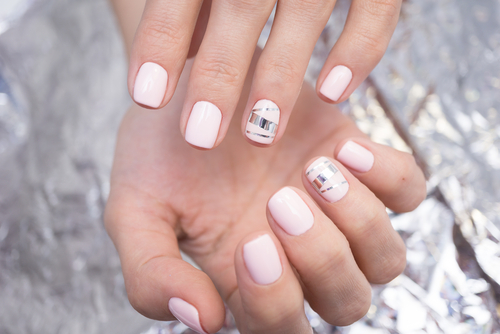 There are many things to think about when it comes to the perfect nail salon for you. When it comes to finding the best nail salon in Chicago for you, you should evaluate the salon’s cleanliness, quality of work, quality of products used, timeliness and convenience of location. First and foremost, cleanliness is the most important. At the Nail Salon at Fringe, our motto is “cleanliness is next to godliness”. Don’t be surprised if you see a bottle of Clorox Everyday Sanitizer left out, we use lots of it. 1. All manicure tables and product bottles are wiped down with Clorox Everyday Sanitizer. 2. All of our expert Nail Techs begin by using hand sanitizer. 3. With each and every manicure service, a new manicure kit is used. These kits include a new nail file, buffer, pumice and orange wood stick. We send you home with these tools after your service to maintain your look between visits. 4. Our professional grade metal tools are sanitized in our special sonic cleaning machines filled with the highest quality industry disinfectant created specifically for manicure and Esthetics tools. All of the services at the Nail Salon at Fringe, begin with a consultation regarding your concerns about the health and shape of your nails. We also like to discuss any wishes or goals you may have for your nails. We understand that many individuals have specific concerns regarding their cuticles and want to ensure the greatest experience possible. At Fringe, we understand that lifestyle and body chemistry play an important role in how long your perfect manicure will last. We keep in stock a large variety of brands and types of base coat, polish and top coat to find the best match for you. We take the time to discuss and solve past issues or concerns. It is these little things that set our work apart. The interior of the Nail Salon at Fringe was designed by New York City salon and retail designer Peter Millard. Well known for his work with designers like Ralph Lauren, Tom Ford, Essie and L’oreal. 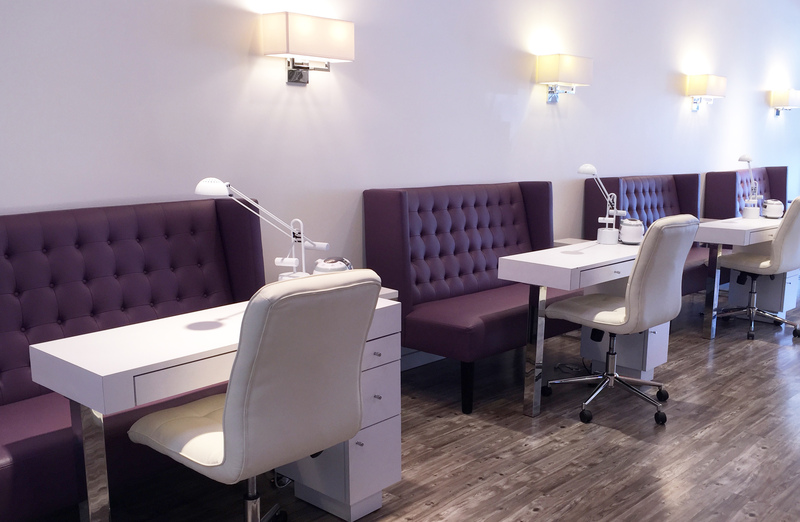 For Fringe he has created a nail salon that is clean, smart and luxurious. With oversized pedicure thrones and manicure love seats covered in the most perfect plum, you are sure to feel like royalty. Pristine white walls and a gorgeous signature Orange ceiling, this is surely the most modern atmosphere in Wicker Park. Our expansive space is great for events of any occasion and scale. We love hosting bachelorette parties, Baby showers, Birthday parties, and even Fantasy Football Draft parties for those of you who want to coordinate your favorite player’s jersey with your nails! 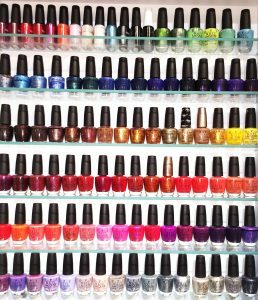 The salon offers an enormous collection of nail polish and gel lacquer to ensure that our guests will be granted the perfect palette for whatever color they have been craving. Not only do we have great variety in color, we also exclusively carry top of the line products including OPI, Essie, Chrome, Mood, Gelish, Shellac, and Chinaglaze polishes as well as an extensive collection of nail accessories. Fringe accepts appointments, we schedule plenty of time for you to get a high quality nail service, feeling pampered and ready to take on the world. Don’t have an appointment? No worries, we always try to keep open appointments for those who wish to be spontaneous. The nail salon at Fringe is open 7 days a week and open until 8pm weeknights.